Climate change is partly the cause of our British Oaks rapid decline, out of all the trees this is one most affected. The other menace to the oak is the Processionary Moth caterpillar, a major defoliator of oak in Europe and a risk to human health. The larvae are covered with barbed and toxic hairs, contact with these hairs or their inhalation can result \r, irritation to the skin, eyes, bronchial attacks and allergic reactions. The hairs can also affect dogs, cats and horses. The caterpillars feed in groups and when not feeding congregate in communal nests made of white webbing spun under a branch or on the trunk of the tree. 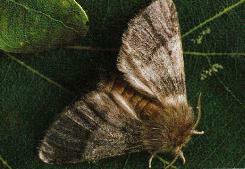 The caterpillars hatch out and the resulting adult moths fly during August- September. The British Oaks are declining due to crown (tieback, canker rot, copious bleeding on the stern, this can cause them to die within only 4 – 5 years. Canker rot is caused by a fungus (Phellinus Punctatus), which is partly aided by drought. Other root and bark attacking pathogens can also play a significant role in killing British Oaks and other species of trees. The tree warning signs will be situated at top and bottom at Clappers Lane,. Fulking.